Well as it turns out this girl will be taking very little into the woods. But even then, the very little adds up. Being an enthusiastic amateur photographer the first decision I had to make was which camera to take. I was torn between taking my Canon SLR or a small compact camera or just relying on the phone. I would love to have taken the SLR but I don’t imagine I would have the time or the energy to take the type of photos I imagined. And having done a few hikes with it I am convinced that it is the right decision. I have taken some photos with my phone and will probably continue to do so. But there were quite a few situations I found the phone camera was limiting. So after researching, deliberating and flip-floping I decided to get a Canon S120. A compact camera with the largest sensor for its size. This means better image quality. Having used it now for a few months I am very happy with the image quality. But on the downside it does not have a USB charger, so cannot be charged off our portable battery. And furthermore it has a relatively poor battery life. So far a battery charge last for about 600 pictures. Bummer, I thought I looked at everything. This was partly solved by getting a spare battery (more weight along with the power cord, the battery cradle and a US power adapter). And charging will have to be done when we are in town. Not ideal, but it will have to do. 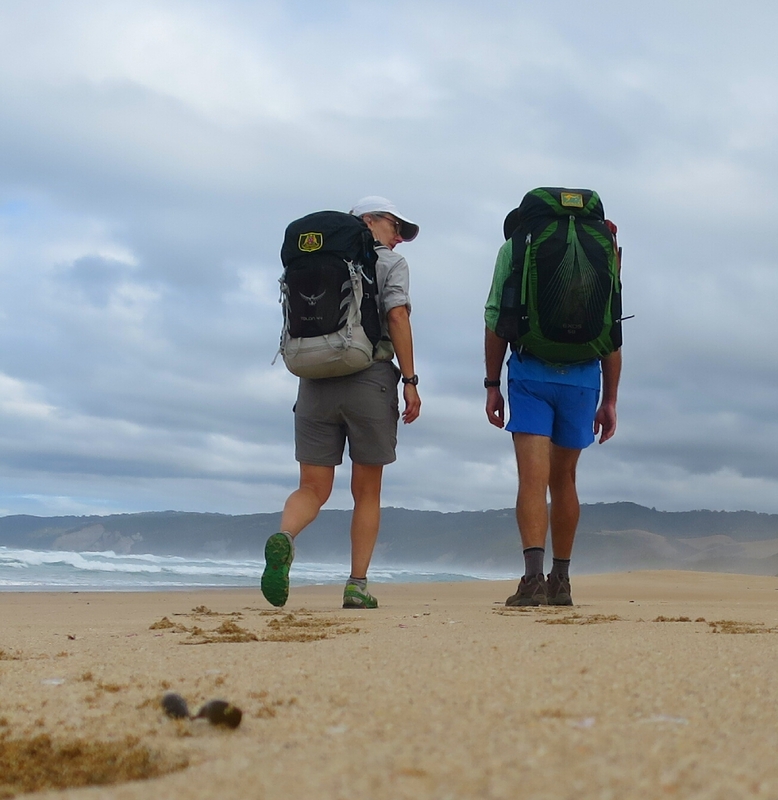 On our training hikes over the past two months, we have had an opportunity to work out what works and what doesn’t and plenty of time to change things over. As there are two of us, we have the advantage of being able to share the load on some items. 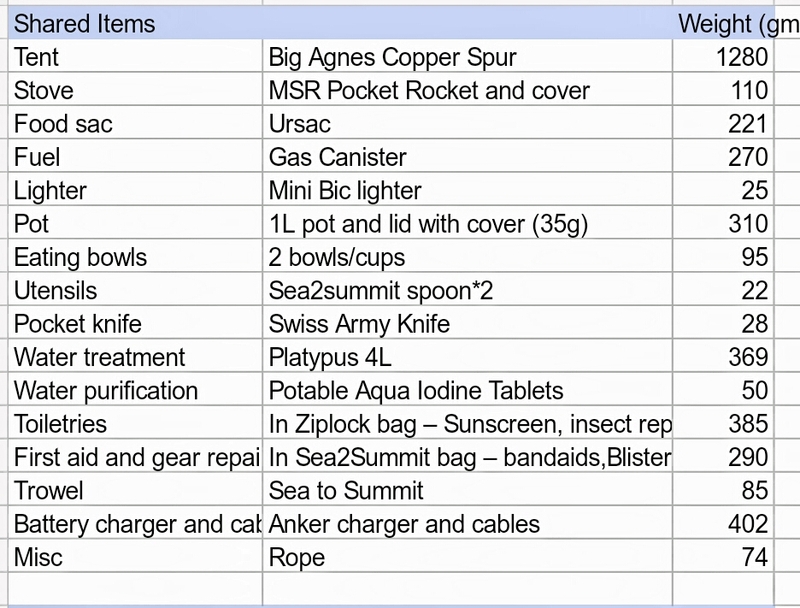 As we will be required to carry a bear canister for food in the Sierras, Hammer will be carrying the food and water treatment and I will carry the tent and kitchen items, as the bear canister will not fit in my pack. 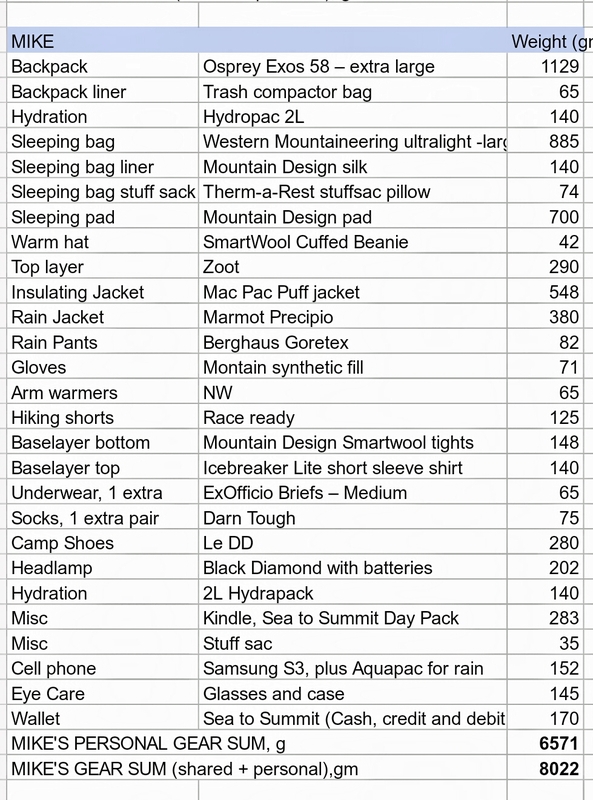 All up the base weight of my pack (minus food and water) is 7.4kg and Hammers’ base weight is 8.0kg. 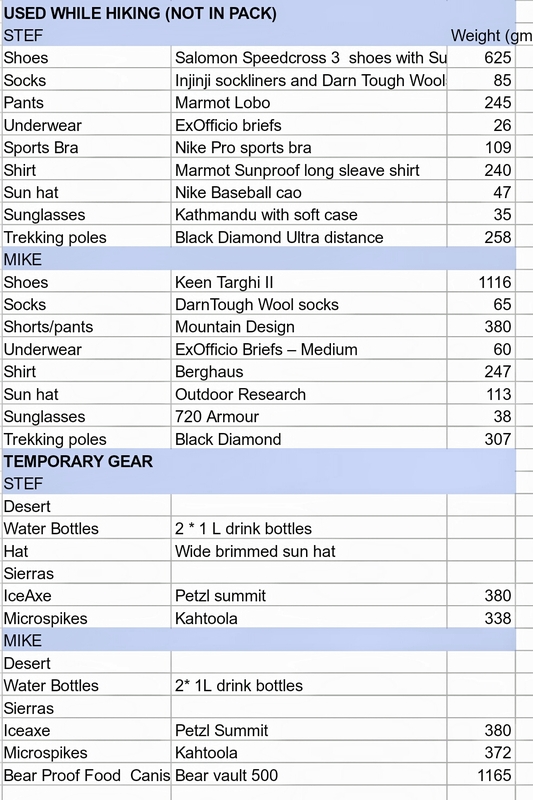 We will be starting with quite a bit of water on Day 1, as water availability will be limited through quite a few sections of the first 700 miles through the desert. 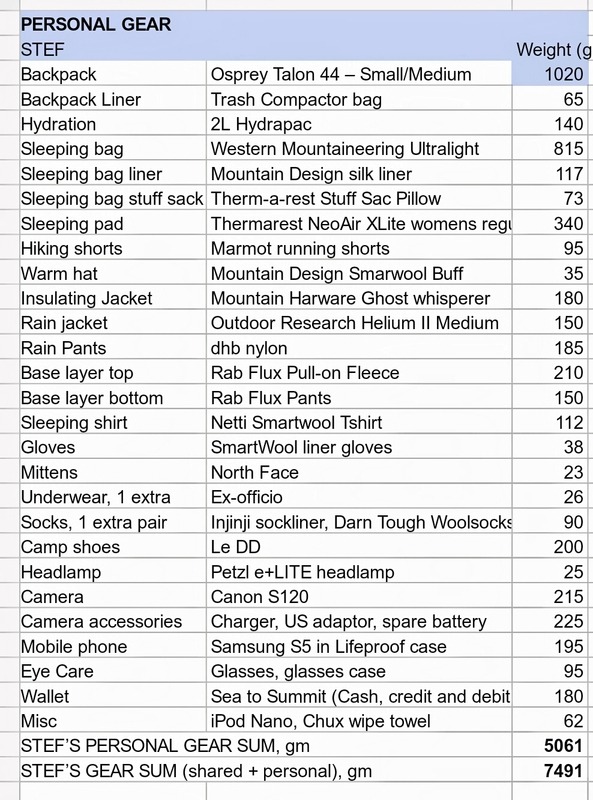 So for anyone interested this is what we are taking on our Pacific Crest Trail hike. We both watched the movie again on the flight over to the US. It is amazing she made any progress with the monster on her back. Getting a bit worried now Maree. Just saw how much snow there is in Northern California. Thank you for the good wishes. We will let the locals know about vegemite and drop bears and hope they teach us about black bears. It is our hope that by the time we reach the Sierras the snow would have largely melted. Never know about endorsements. I do love my Salomon shoes 😉. We are a week away from starting. Currently touring NorCal, fattening up for the trail. Will post an update. Super, just saw the comment after replying.